I first heard about break week when I read “Teaching From Rest,” but Mystie Winkler gave me a better understanding of what it looks like during the school year. This idea of break week is still a bit new for our family, so we still have quite a bit of tweaking and fine tuning to do. However, I still found it to be very beneficial to our family. 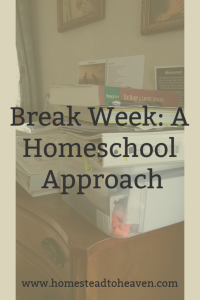 By the end of the six weeks leading up to break week, my brain was starting to feel frazzled with schooling the kids and everything else that was piling up. My husband’s work schedule changed and I was having a lot of trouble readjusting to how it affected the flow of our week. I had a ton to do, but had no clear distinction of what to do when. That is something I’m still working on. Although we’ll still be re-figuring out the flow of our week during the next six weeks, this break week allowed me to tackle some of the things that needed to be addressed. I was able to evaluate where my children were in their schooling – what was working and what needed to be tweaked. At the beginning of the school year, I tweaked our actual schedule and removed some aspects of our curriculum that were taking away from the over-all peace of our family. During this break week, I was able to tweak some aspects of the subjects themselves. For Language Arts, we are using Logic of English. I initially placed both my 7 and 8 year old in Essentials. 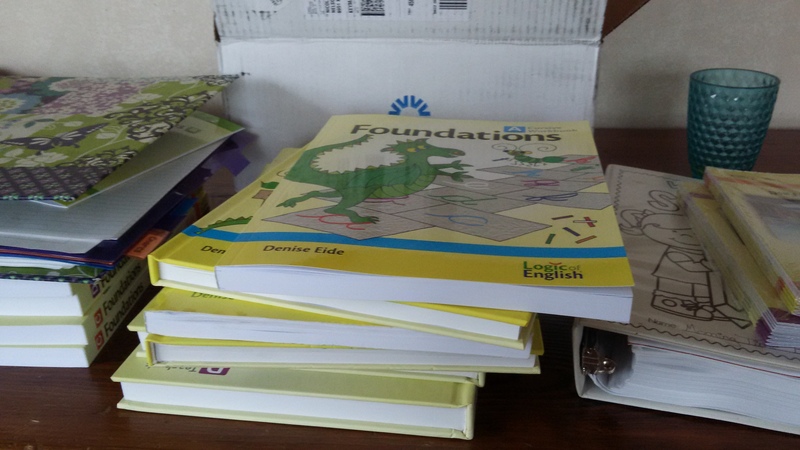 However, my 8 year old has some areas developmentally where he struggles, so I was able to assess that he needed to be doing Foundations instead. My 6 year old is currently doing Foundations, but he seemed to be getting bored with the material that was a little too easy for him. I ordered the next levels in Foundations and will place him at a higher level. 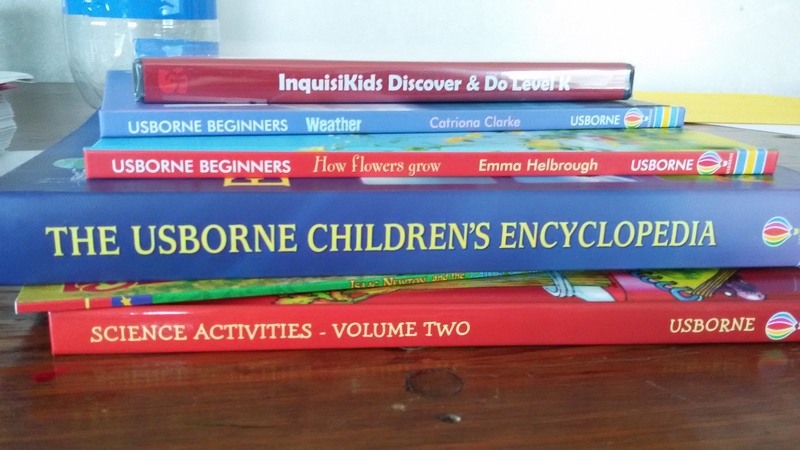 My plan is to have both my 8 and 6 year olds complete the reviews in each book until we come to a place where each is challenged. I also realized that I don’t do very well with nature walks. Since this is the backbone to our science I knew that I needed to change something. 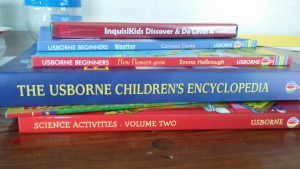 I went ahead and bought one of Sonlight’s science kits – my hope is that this will allow us to get a better grasp on science while still taking advantage of good books. On another note, I ended up getting sick during the break week. Although that interfered with getting things done, I was glad I didn’t have to worry about staying on top of my kids’ schooling during the peak of not feeling well. On the nights my husband didn’t work, I was able to get a decent nights’ sleep to allow my body to heal. We also ended up travelling during our break week. There are still quite a few things left to do related to moving. We finally had the inspections and repairs done on our van that needed to be completed before we could get our new title and plates. But, of course, somehow we misplaced our original title to our van and needed to make a quick trip to Ohio to get a new one. This trip allowed us to also make a quick visit with family in the area! Although we didn’t get all of the piles cleared during this break week, it allowed us a change of pace. Now I think we’re ready to tackle the next six weeks of school.